Right up front I’ve got to admit that 2 months ago I never thought that I would score this high on the GMAT. And to be sure, I wasn’t clear on what I needed to do to crack 700. I’ve read a lot of the success stories here and there are certain advices that seem to ring consistently – but they just didn’t mean much to my practice results. I kept what I thought was a decent error log. I took notes after my cats and reviewed them regularly. I worked through the entire OG. But I wasn’t making any additional progress beyond a certain point. I started studying at the end of April with a 520 on my first practice cat. Since I was going to be traveling a lot for work I knew I’d need something flexible to study with, so I signed up with Magoosh. I really liked Magoosh a lot (their program is easy to work through and I could set my own study hours). Over the course of about 1.5 months I was able to raise my score up to 630 on the Veritas cats. I was happy with my progress and trying to figure out how to pick the next 100 points up (my goal was 730 or higher). Then my scores got stuck at about the 2-month mark; I got three 630s in a row and couldn’t get around my pacing. I was always having to guess on 5-6 questions near the ends of the q and v sections. I can man-up and admit that I’m a stubborn guy (and I’m sure my ex would have no problem confirming that). However, I refused to let my attitude keep me from my goal so I had to admit that I didn’t know how to make things better on my own. 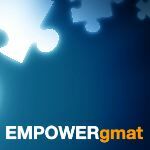 I reached out to a bunch of gmat companies to ask some questions and get advice. Everyone I emailed seemed professional and willing to help (although one company took 3 days to respond to my email, which I thought was terrible customer service; if I left any of my clients hanging for 3 days my boss would probably boot me out the door). Some of the advice was generic and more sales-y than I was hoping for, but I took it all in and went for the option that seemed most on point for how I had been working up to then. Brian and Rich at Empowergmat provided some really useful analysis of my cat scores and were able to determine how I was working inefficiently. Rich even correctly described a lot of how I was handling the gmat before I answered all of his questions (and it was a lot of questions ;p). He seemed to know exactly how I was doing CR, SC and DS questions and why my pacing was so bad. Thankfully all of that back and forth was worth it! I signed up for the Total score booster which took me a little over 7.5 weeks to finish and I cracked 700 for the first time after about 4 weeks of studying with Empower. During that time, GMAC started offering the new ‘choose your own section order’ options and the Empower advice really helped me there too (I ended up choosing q/v/ir/essay). If you’re spending 1.5 to 2 minutes solving a SC question, then you are doing something significantly wrong. Stop working that way and learn another way instead. Skimming instead of properly reading gmat questions is a dumb idea and it won’t get you a high score, so stop doing it. Learn to read with purpose and at a reasonable rate (just 150 words per minute-ish is all it takes). When you choose to do work in your head then you seriously increase your risk of getting the question wrong. Thank you Rich for beating that into my brain. I changed my attitude completely regarding taking notes and my score is proof that you are correct about all of that. There will be questions that you should quickly skip past in the q and v. You’ll thank me for this one later. You’re not going to take the gmat at home on a laptop computer, so don’t take your cats that way. It takes a lot of time and effort to make all of these changes. The changes are not that big a deal though so you have to make a concerted effort. My original way of facing the test was never going to get me a score much higher than a 630 so I made the tough choice to change my ways to ones that would lead to a much higher score. When I think about it, the funny thing is that it’s really not that hard to do what I did on the gmat. Admitting that I couldn’t do it all on my own and mentally making the changes to get to that point were the hard parts. Now I've got bigger fish to fry! Good luck, ladies and gents. Originally posted by CJRJr on 29 Aug 2017, 23:41. Last edited by Narenn on 31 Aug 2017, 06:19, edited 2 times in total. That's OUTSTANDING news! With a 750/Q51, you have an OUTSTANDING Score and can comfortably apply to any Business Schools that interest you. Since you mentioned an interest in Top5 Programs, you might want to consider working with an Admissions Expert. Are you planning to apply this year? You clearly have the GMAT "piece" of the puzzle covered, so now you have to make sure that you correctly assemble the rest of your application and properly "market yourself" to each Program that you apply to. We actually recommend a specific Admissions Expert for these Schools - and we can set you up with a free consultation if you're interested. Congrats on all of your success so far! and something that I have changed in my process recently.